The word ‘yoga’ is a derivation of a Sanskrit word which means ‘yoke’ or ‘union’. The purpose of yoga is to train all the human elements: the body, mind, and spirit. In the more spiritual and macrocosm form of things, connection of the individual to the universe. These are all accomplished by the yoga practitioner learning and executing different physical positions, controlled breathing and meditative exercises. All of these activities are usually accompanied with chanting. The discipline also encompasses a healthy lifestyle by urging the practitioner to seek a higher consciousness and follow good moral habits. For a thousand of years, many practitioners have tried to seek the spiritual union that yoga tries to reach. A popular notion is that yoga has existed in India for at least 4,000 years, though there have been 5,000 year old cave drawings discovered that accurately depict yoga poses. For many years, the tenets of yoga were only known to a small group that isolated themselves from others. Those that taught the discipline were imitating the movements of wild animals. The yoga techniques have been traditionally passed down orally from teacher to student. The word ‘guru’ is Sanskrit for teacher. Yoga was incorporated into the Buddhist religion by its founder, Prince Siddharta Gautama. Prince Gautama was already well versed into the different forms and practices of yoga. The Buddhist religion itself was supposed to a solution to the problem of human suffering. Followers of Gautama followed Buddhism and practiced yoga up until the third century when the political environment became less tolerant of non-Hindus. It was at this point when the Buddhist monks and disciples migrated in droves across the Asian continent. It was at this point where Buddhism and yoga were spread throughout Asia. Over time, the Buddhist monks became an integral part of the cultural fabric wherever they landed. Thus, yoga practices were slowly incorporated into the native religion of Japan, China, and many other Asian Countries. The British colonial expansion into India was the main reason how yoga infiltrated Western culture throughout the twentieth century. The knowledge of the physical, psychological, and metaphysical practices were appealing and gained popularity with the new inhabitants. The World Parliament of Religions, which was held in Chicago in 1893, brought many yoga gurus to the United States for the first time. Many books were published on the subject of yoga in the 1950s and 1960s. Swaimi Rama, founder of the Himalayan Institute in Pennsylvania, shocked many researched when he demonstrated the ability to remain clear and lucid, yet having the ability to stop his heartbeat for a long period of time while his brain registered sleep signals. It is important to understand the overall goal of yoga before understanding its general scope. The goal of yoga is connected with the Hindu view about the relationship between matter and the spirit. In this view, the spirit that animates the universe also animates every individual human. Thus the universe and all of the individual beings could be thought of as one. Everything, from the blade of grass, to the individuals are connected to one another. When a spirit dies, it reincarnates into a more complex form of matter according to the moral code known as karma. When the spirit reaches the human form, there is an ability to realize the nature and history of its past. Yoga helps connect the human being to the past. There are several types of yoga that are practiced. The most common form of yoga in Western countries is hatha yoga. The most popular forms of yoga practiced in the west have a main emphasis on a sequence of postures or asanas which are held in a static pose and moved through a dynamic sequence. Breathing control, hand positions, and meditation are also emphasized throughout the exercise. Concentration is focused on an object, or on a breathing repetition or rhythm of a chanted sound called a mantra. This form of yoga is a very vigorous form which involves a lot of movements and breathing while performing a sequence of poses. Ashtanga yoga is meant to build stamina, strength, and flexibility. A modern variation of Ashtnaga yoga is called power yoga has gained a lot of mainstream popularity in the United States and is commonly thought of as a cardiovascular workout. Though most forms of yoga have been formally separated by some kind of spiritual influence, one exception is bhakti, or devotional yoga, which has a heavy emphasis on devotion. Though there is no formal religious affiliation, bhakti yoga emphasizes meditation on the idea of an existence of a divine being. Bikram yoga, also known as hot yoga, is practiced in rooms that are heated to around 39 0C (1000F). The purpose of bikram yoga is to sweat profusely in order to loosen up the tendons and muscle, which will promote inner cleansing. This can be used by beginner and advanced yoga practitioners, bikram uses about 26 postures in a set sequence. People that are on medication or have an acute or chronic condition should check with their doctor before engaging in bikram yoga. This is the most common form of yoga in the Western world and has its roots in an ancient tradition. The word hatha is derived from the Sanskrit words ‘ha’ and ‘tha’ which means ‘sun’ and ‘moon’, respectively. The purpose of hatha is supposed to emphasize the balance. 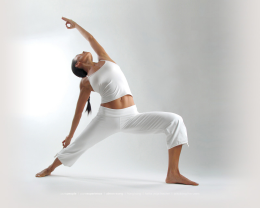 Hatha yoga utilizes breathing exercises and physical postures. Iyengar is a very methodical and slow form of yoga that emphasizes form and stillness for each posture. Props are used, such as blocks, bolsters, ropes, chairs, and mats, to enable the best possible physical alignment. This is an accessible form of yoga to those that are limited in their flexibility and fitness level, yet it is also practiced by those that are more advanced since the exercises form a carefully graded progression. The meaning of karma is ‘to do’. It also usually refers to the Eastern philosophy universal principle of cause and effect. In the practice of yoga, it implies working with awareness by attempting to integrate yoga practices into daily life. Meditation plays a large role. Raja means ‘kingly’, while raja yoga means ‘royal road’. This form of yoga emphasizes study, mediation, exercise, and breathing to bring the mind and emotions into balance and produce a well-rounded individual. Yoga has a long tradition of healing different ailments. It also is a very important component of Ayurvedic medicine, an ancient Indian form of medicine. Yoga can help stress and anxiety, with meditation. Several studies have shown the benefits of yoga in treating depression. Psychiatrists from the National Institute of Mental Health and Neuro Sciences in Bangalore, India found that a type of yoga has been found to show significant improvements to those that reported they were depressed. Australian researchers found through a 2004 study that many measure of behavior prolems improved in boys with ADHD after 20 yoga sessions. In an Indian Study performed in 2002, 20 middle aged patients with hypertension practiced yoga for ne hour a day for over three months. Over time, the patients were reported to have lower blood pressure, lower levels of blood glucose, cholesterol, and triglycerides. A 2004 study from a New Jersey college showed that after a six week course of hatha yoga which was designed to relieve lower back pain, all 22 of the affected patients were cured. In a study out of the University College of Medical Science in Delhi, India, 24 patients with type-2 diabetes had an improved blood sugar control after doing yoga for 40 days. Blood pressure and pulse rate also improved. In a 2005 review in the journal Cancer Control, 9 studies that were conducted with cancer patients and survivors exhibited that yoga gave an improvement in sleep quality, mood, stress, cancer-related distress, cancer-related symptom, and overall quality of life. Pregnant women that did yoga for one hour a day had lower rates of pre-term labor, intra-uterine growth retardation, and pregnancy-induced hypertension. Yoga is generally believed to be safe if practiced under strict guidance and advice from a medical doctor. Yoga has been shown to improve lung function and airway sensitivity. A 1996 study published in the Indian Journal of Medical Research found that patients that participated in sahaja yoga had lower incidence of seizure, compared with control. Regular yoga has been shown to relieve fatigue symptoms in those afflicted with MS, according to a 2004 study performed by Oregon Health & Science University published in the Neurology. Yoga is generally a safe form of exercises. Advanced yoga has been linked to one case of pneumothorax. People that have a lung or heart disease should avoid complex yoga breathing techniques completely.